If you're on serious mode, go watch Body of Lies. If you're on kiddie mode, watch Igor. But if you just want to laugh, then go see Tropic Thunder. Of course, the premise is not new. Other films have been done before using the "film-within-a-film" approach, like Living in Oblivion for example. But I think Tropic Thunder takes the humor to a whole new level. The story is just about some movie stars filming a movie set in the jungles of Vietnam. That's it. Now that we've gotten that out of the way, let's go to the cast. A film like this, meaning a movie-within-a-movie type, will not be as effective if there is no all-star cast. 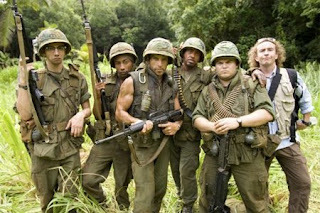 And that's what Tropic Thunder has─a powerhouse cast. Jack Black, Robert Downey, Jr., Nick Nolte, Matthew McConaughey, and Tom Cruise himself, just to start the ball rolling. And those are just the A-list stars. There are lots of other known actors in this film; too many, in fact, that if I name some of them, I'd have to name all of them just to be fair. Jack Black is hilarious as Jeff Portnoy, the actor slash addict, and Jack Black does what Jack Black does best: act weird. Try to imagine a toned-down version of his role in Orange County (the film, not the TV series), only here, there is no actual drug use, but withdrawal symptoms. And Jack Black does a great job of playing a really obnoxious character without upstaging the others. Now of course, there's Robert Downey, Jr., who plays Kirk Lazarus, method actor extraordinaire. Nobody doubts Downey's acting abilities, and here he cements his status as one of the best method actors in the business today. And one of the best quotes from Downey: "I don't drop character until I've done the DVD commentary." Tom Cruise of course surprises us all with his terrific performance as Les Grossman, the potty-mouth studio mogul who swears at a rate of probably thirty profanities per minute. Mr. Cruise had to wear some prosthetic make-up for the role, and he comes off as practically unnoticeable, unless you know the sound of his voice. Well, he may sound like Tom Cruise, but he sure doesn't act like Tom Cruise. This is in fact one of those rare moments where Cruise sheds his poster-boy image and unleashes his funny side. And last but not the least, Mr. Ben Stiller himself. Stiller is in fact pretty comfortable just staying in the background while the rest of his co-stars do the dirty work. But he sort of glues the whole movie together with his presence, which is of course a given, seeing as he co-wrote, produced, and directed the entire film. Ben Stiller's directing ability has never been in question; it's just that most of the recent films he's acted in haven't done too good in the box office. But this film redeems him, and let's hope he sustains this lucky streak. There are several elements of a movie-within-a-movie type of film. These are 1) a star-studded cast, or at least a lot of known actors; 2) homage to previous blockbuster hits (I said homage, not parody); 3) constant references to other films; and 4) an insight into the world of movie-making or show business in general. This film has all of these elements, and it also has lots of humor without crossing over to the realm of spoof movies like the Scary Movie franchise. All in all, great movie, great direction, great cast. Rating: Four and a half stars. What is that supposed to mean? Are you a spambot?